On 7 Sept. 11 at the multipurpose stadium in Chéraga county, the capital Algiers, was held National League Vietnam Vovinam Vo Dao – Second Cup ambassador, with the participation of 500 martial born under 70 teams from 22 provinces of Algeria. 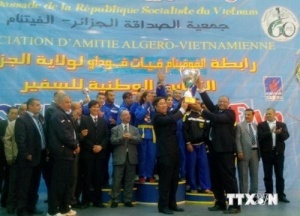 Ambassador Vu The Hiep awarded Vovinam League Cup in Alger. With the enthusiastic cheers of the audience, the martial born Algeria had played their best expression in the performing category, fighting against unarmed resistance, fighting antagonistic weapons (knives, swords, knives, rooftop Cone, machetes, knives contemporary …). After more than two hours of vigorous competition and attractive, Ambassador Cup was handed to the National Security team. The Olympic team won the second prize and Ouadsamar Bourouiba winning traditional ba.Vo Vietnam are prevailing in Algeria. Three Vietnamese Vovinam Vo Dao Association, Song Long boxing and airways shop now attracts around 15,000 students participating martial, of which Vietnam Vo Dao goal is 9,000 people working in 140 clubs across the country. Algerian Ambassador to Vietnam Vu The Hiep confirmed the organization at this tournament – by the Corporation of oil and gas exploration in Vietnam (PVEP) financing – further contributing to mount the two countries and nurtured more friendly relations and cooperation between Vietnam and Algeria. Vietnam Vovinam masters Vo Dao was taken to Algeria Mohamed Djouadj in 2001 and has made great progress since then. Vietnam Vovinam Federation Vo Dao Algeria has successfully hosted many championships, big national award and continents, and participated in many international tournaments. Vietnam Vovinam Federation Vo Dao Africa was established in 2012 with 13 member states.